The Police were called, and two women visitors to the Monument who had been in the vicinity of the incident were detained and questioned. Of these women, one was released as there was no evidence against her, but the other, who had been found in the room with the broken case and whose hands were found to be bleeding, was arrested and her name given as Edith Johnston, of 12 Queen Street, Edinburgh. Edith Johnston was in fact one Ethel Moorhead, who was one of the most turbulent and pro-active suffragettes of her era. Ethel was of a colonial military family, who had settled in Dundee in 1905, and by 1910 she had joined the Womens Social & Political Union (WSPU). During Ethel’s ‘career’ she used a handful of different names and happily supplied false addresses, which no doubt slowed down the legal process each time she was arrested. Ethel was an ardent supporter of the suffragists’ cause, and a proponent of direct action. The Suffragettes often sung ‘Scots Wha’ Hae wi’ Wallace Bled’ at their meetings, and saw Wallace as something of a kindred spirit, as he too had fought for his freedom with direct action. 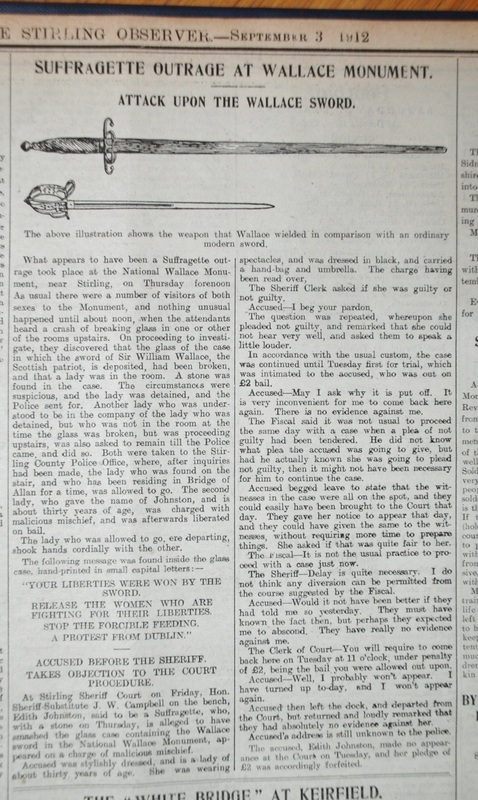 So, smashing the glass case holding Wallace’s sword was both symbolic and a way of getting national attention for the suffragette’s cause, which otherwise tended to be dismissed by the powers of the day and the press as unworthy of being taken seriously. After the incident at the Monument, Ethel was arrested and spent one night in the cells in the County Buildings, Stirling. (She later complained about her time there, stating that the ‘drunk cell’ was dirty, smelled and was unsuitable. More information can be found about this complaint in the Stirling County Minutes for the same year, SC3/1/23). Ethel was bailed, bandied words with the judge, then failed to appear for her next hearing, forfeiting her £2 bail money. She was eventually sentenced to six days imprisonment to be served in Perth Prison, having mounted her own lively defence in court. In October 1912 Ethel and some suffragette colleagues returned to Stirling to give a talk to local people about the cause of Women’s suffrage. Everything, from the incident, the trial and the talk was covered in detail in the local newspapers, and even the national press, so it may be argued that Ethel successfully achieved her aim of drawing attention to ‘the cause’. 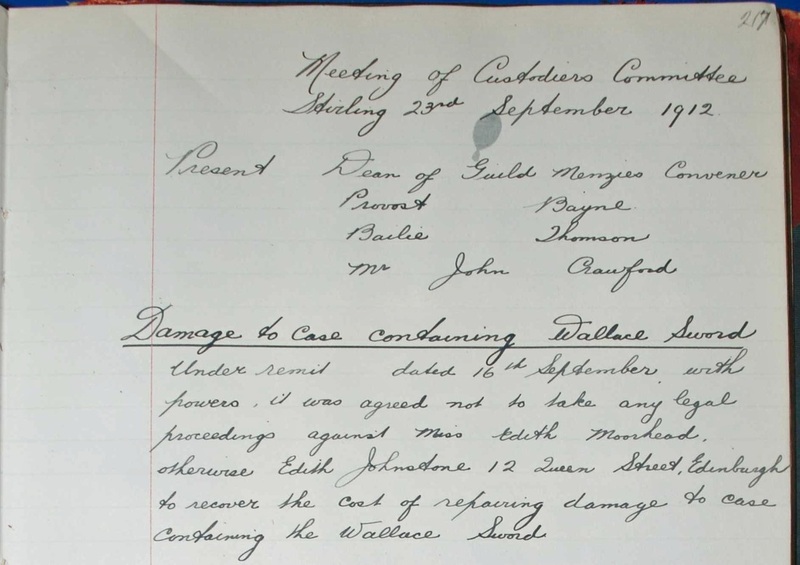 Wallace Monument Custodiers’ Minutes SB10/1/2, which reveal there was much discussion about whether they should try and reclaim the cost of the case’s repair from Ethel. 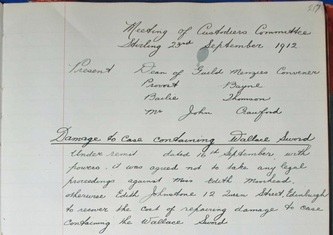 In the end, the Custodiers’ Committee decided against this.